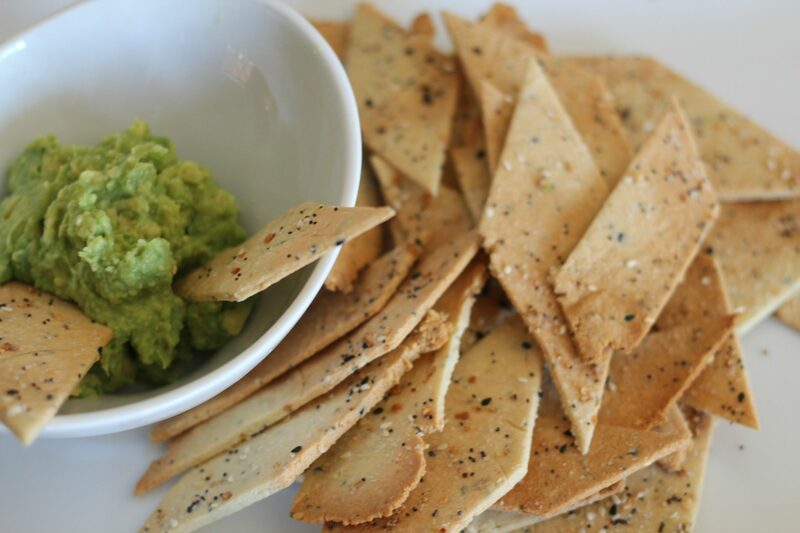 Making your own low carb crackers is a cinch! Who would have thought? Create these tasty low carb everything crackers and serve them with your favorite cheese, spread or topping! One of the things I love is a good crunch. 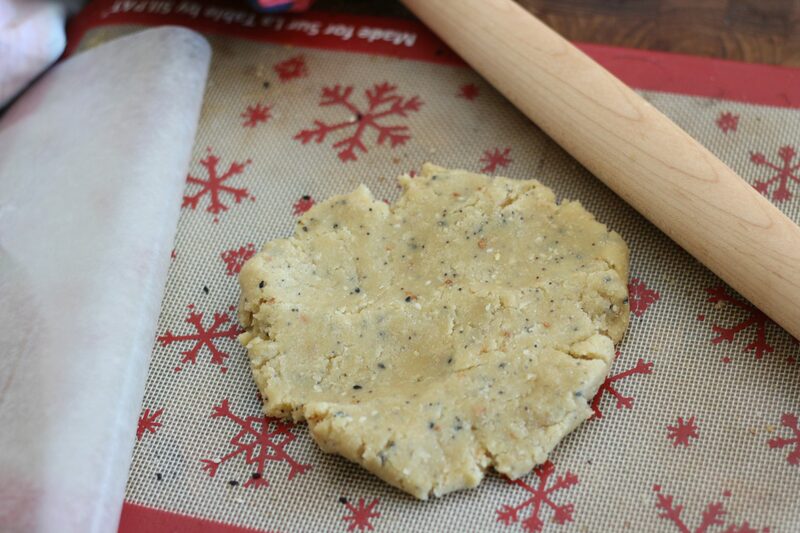 Crackers are amazingly fulfilling in the crunch department and this cracker recipe hits the spot. Do you want to know why they are called Low Carb Everything Crackers? Well, it’s because they are seasoned with my favorite thing..
Everything But the Bagel Seasoning from Trader Joe’s. Yes, this stuff is awesome. 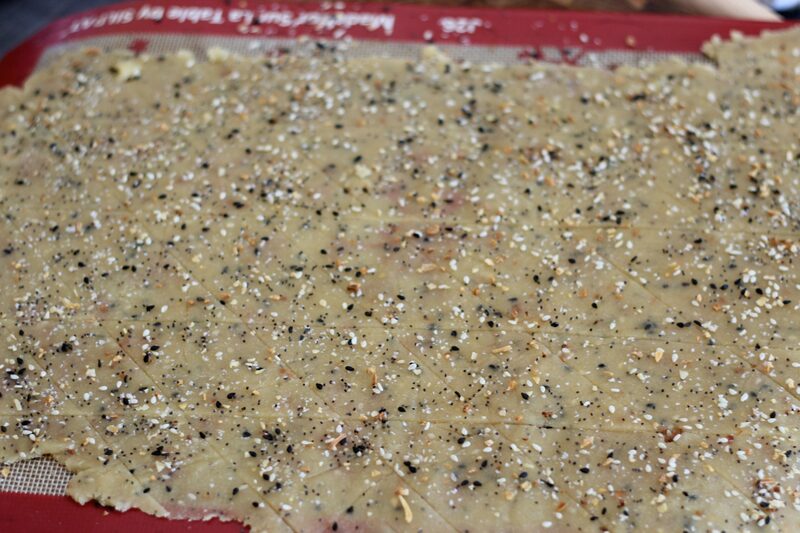 It’s a mixture of sesame seeds, poppy seeds, dehydrated garlic, salt…all the yummy stuff. Now this seasoning is only $1.99 at my local TJs, but when I went yesterday they were all out. I guess it’s a hot seller for them. I saw it listed on Amazon, but it looks like someone is making a killing on it! It took a couple tries to get this recipe just right. You would think so with such few ingredients. The trick is to roll the dough thin but then don’t let it burn on the oven. Oh and the first time I made it, I was yay too hesitant with seasonings, but I’m telling you don’t be afraid! SEASON THAT SH*T! Sorry, I got a little excited there! Roll out using parchment paper or a Silpat for the bottom and either more parchment or waxed paper on top. You want to roll it out thin, so it’s almost see through, about 1/8 of an inch thick. Then sprinkle on more of the Everything But the Bagel seasoning. Place the waxed paper on again and push the seasoning into the dough so it doesn’t fall off. At this point, remove the waxed paper and use a knife or pizza cutter to cut the dough. Squares, rectangles, diamonds, triangles, pick your shape! 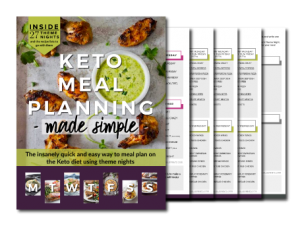 Craving a different type of low carb snack? How about this Garlic, Rosemary and Parmesan Cloud Bread! Now, transfer the dough on the parchement paper or Silpat to a baking sheet and bake at 350F for 10 minutes. Check on it and if it doesn’t seem cooked and golden add another minute or two. What are you going to serve your Low Carb Everything Crackers with? Cheese? Guacamole? Veggies? 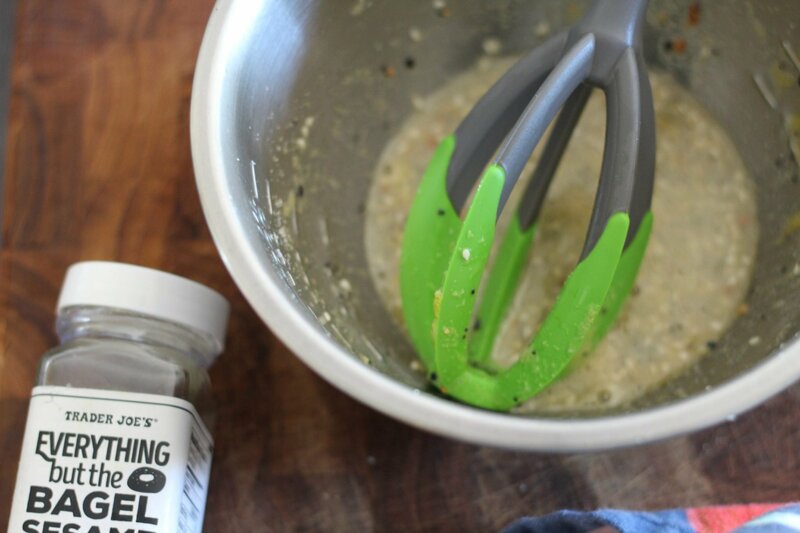 Whisk together the egg, garlic powder, onion powder, salt and one tablespoon of the Everything Bagel seasoning. Stir in the almond flour, mixing until it resembles a dough. Flatten between two sheets of parchment paper or on a Silpat and waxed paper. Roll out to 1/8 inch thickness. Sprinkle on the remaining tablespoon of bagel seasoning and pat into dough using the waxed paper. Cut into squares using a knife or pizza cutter. Transfer parchment or Silpat directly onto baking sheet. Bake for 10 minutes. Check to see if golden brown and cooked. If not add an additional 2 minutes. I have to go and get some of that seasoning, how cool! I found a great deal on almond flour recently, so once I get that spice, I am trying these out. 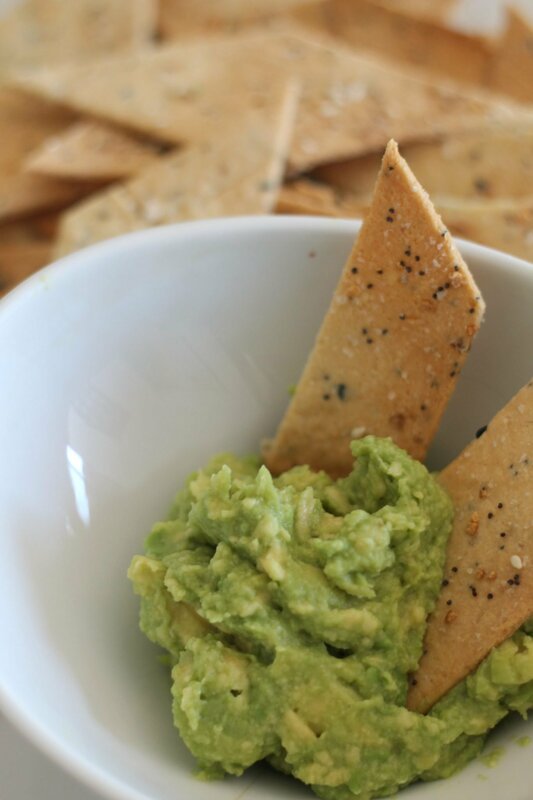 Thank you for sharing your yummy low carb crackers with us over at the party! Happy Fiesta Friday! I don’t have any Bagel Seasoning but I bet it would be good with a lot of breads/crackers. Thanks for the pointers. Happy Fiesta Friday and thanks for sharing. Trader Joe’s sells Everything Bagel Seasoning. I just pinned your awesome crackers and will be making this recipe! Thanks so much for sharing your awesome post with us at Full Plate Thursday and come back soon! I have never made crackers but, want to now! Thanks for sharing at the Inspiration Spotlight party @DearCreatives Pinned & sharing. These are in the oven and smell delicious! TJ’s everything spice is one of my favorites and cannot wait to eat them. Oh and a also threw in a small handful of finely shredded mozzarella cheese. Oooh! Let me know how they turned out with the mozzarella! Great looking recipe can’t wait to try it! How do you store these and for how long?? Thanks! I just store them in an airtight container. They get eaten pretty quickly around here, so I’m not sure really how long they last. I do know they lose their crispness after a couple of days though. Great recipe. A young lady at Trader Joe’s gave me a tip about storing the seasoning. She says store it upside down and all the salt won’t be in the bottom of the bottle. Thanks soooo much. I have been eating keto since June and really, really missed crackers! Many recipes out there but you had me at TJ’s everything but the bagel. Making salm9n dip for the holiday and can’t wait to place these alongside. Be sure to let me know how they turn out! 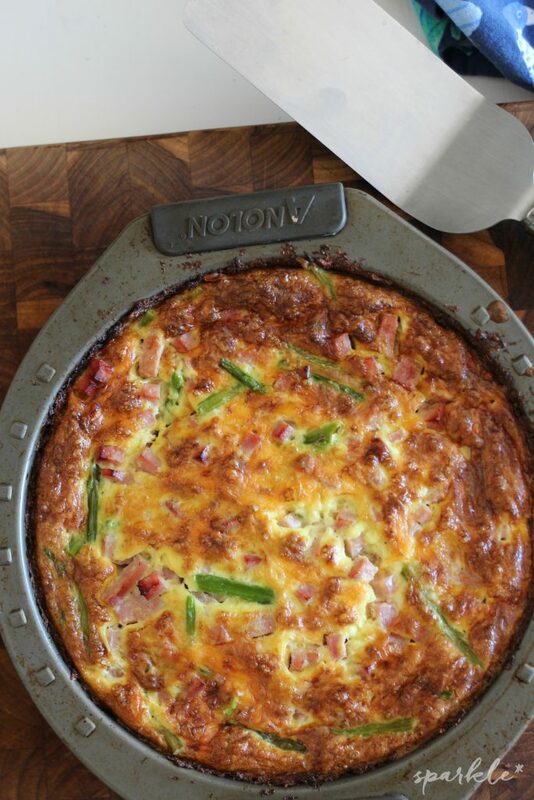 This recipe has been a lifesaver, especially around the holidays. Was fab with salmon dip but they rock even by themselves. So nice to have the option of crunch with a piece of cheese or salami. Probably making them way too often but will never be without! Thanks again. I did recalculate it, and I got 5.8 total carbs and 3.5 grams of fiber. That makes 2.3 net carbs per serving. I think that is better than regular crackers.